U.S. coin production in October ran the quickest since March and faster than a year earlier, according to manufacturing figures published by the United States Mint. U.S. Mint figures also provide mintages for New Jersey’s Ellis Island quarter, the fourth of five 2017-dated quarters with unique designs. 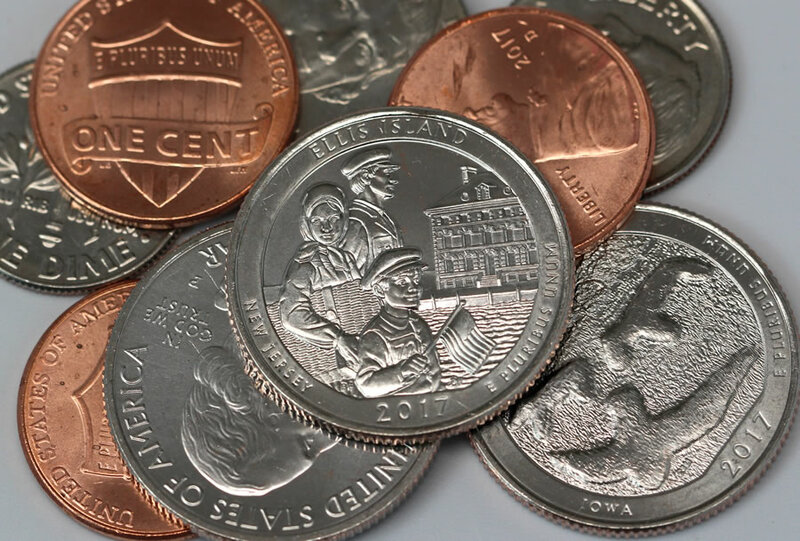 Over 1.4 billion in cents, nickels, dimes, quarters and half-dollars were pressed for circulation last month, lifting the year-to-date total to over 12.7 billion coins. 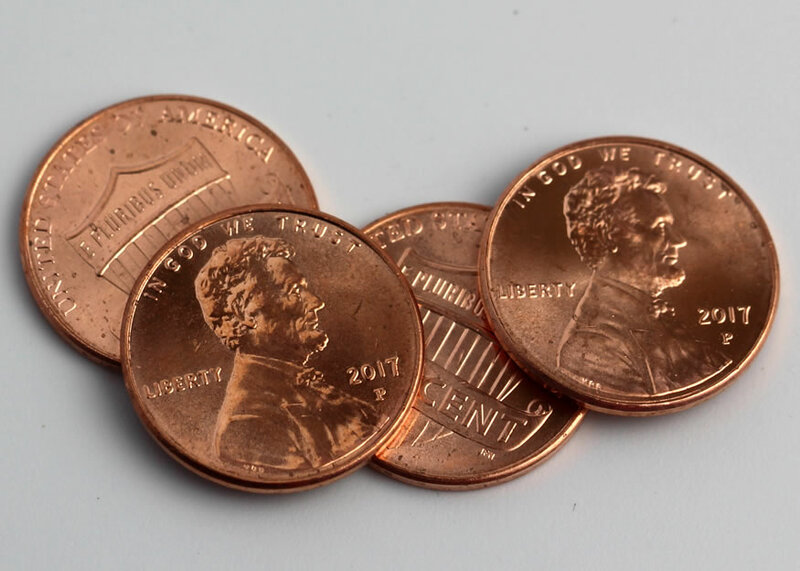 The Federal Reserve orders more 1-cent coins from the U.S. Mint than any other denominations even as it costs 1.5 cents to make and distribute each one. The agency struck 856.42 million Lincoln cents in October for 60.2% of the circulating-quality coins produced for the month. 2017-dated circulating cents from the Philadelphia Mint bear a ‘P’ mint mark for the first time in history. This is a one-year-only embellishment, added as a part of the U.S. Mint’s 225th anniversary celebration. These P-cents are not rare, however, with more than 3.75 billion already made through the first ten months of this year. 4.3% fewer America the Beautiful Quarters. Native American $1 Coins and Kennedy half-dollars are no longer ordered by Federal Reserve Banks but they are still made in circulating quality for coin collectors. In January, the U.S. Mint tends to strike both coins to the expected amounts needed for the entire year. The agency in April did produce 140,000 more 2017-P Native American dollars. In October, it also struck 1.1 million more 2017-D Kennedy half-dollars. Production facilities in Denver and Philadelphia manufacture all of America’s coins for commerce. Last month, the Denver Mint made 699.46 million coins and the Philadelphia Mint made 724.08 million coins. Year-to-date figures at 6,260,600,000 coins from Denver and 6,489,640,000 coins from Philadelphia total 12,750,240,000 coins, representing an 11.1% decline from the 14,344,690,000 coins minted by the same time last year. This year’s monthly average of more than 1.27 billion coins tracks over 12 months to about 15.3 billion coins. The U.S. Mint produced over 16 billion coins in 2016 after making more than 17 billion coins in 2015, the most since 2001. 2017 Native American $1 Coin, released on Jan. 25. 2017 Effigy Mounds Quarter for Iowa, released on Feb. 6. 2017 Frederick Douglass Quarter for D.C., released on April 3. 2017 Ozark Riverways Quarter for Missouri, released on June 5. 2017 Ellis Island Quarter for New Jersey, released on Aug. 28. Mintages for the Native American dollar at 1.54 million from Denver and 1.82 million from Philadelphia combine to 3.36 million coins. Last year’s design ended with splits of 2.1 million from Denver and 2.8 million from Philadelphia for 4.90 million coins. Mintages of New Jersey’s Ellis Island National Monument quarters were reported for the first time, registering at 254 million from Denver and 234 million from Philadelphia for a combined 488 million. These amounts are nowhere near mintage lows for the quarter series. They’re actually the highest of any design this year. Production figures include 3.4 million quarters that have yet to be officially assigned to a coin design. These are likely early runs of George Rogers Clark National Historical Park quarters. Coin production figures in this coin news article are based on data aggregated from the Mint’s webpage at: https://www.usmint.gov/circulating-coins-production. 1.1/2 U.S* cent’s it cost$ us to mint 1 U.S* cent. Our U.S* minted 856.42 million cents for the month of October 2017, so it cost us* more than 423.21 million 1/2 cents for October. It must be in or close to a trillion dollars by now, that cost$ us* ah 1/2 cent to mint just 1 U.S* mint cent all these past years. Do our* Fed*s know something we*don’t. Save your penny*s.
I haven’t received a dollar coin in change in the past 5 years…ever…not once….please stop producing the paper version. Does anyone have any dollar value for the non collector versions of the coin sitting on bank shelves, I’ll guess it’s a very very large number. I know the mint has to legally produce the penny, but it has to stop, waste a waste of money. Can anyone explain why they would mint 1.1M more D mint Half Dollars? Considering they sell an equal amount of both P and D mint by design of their offerings it doesn’t make sense to me. datadave – hi, ? how does our *mint sell ”’equal”’ amounts of 1/2 dollars if our mint* minted 1.1,million more *Denver mint 1/2 dollars. I* don’t know why they would mint 1.1,million more “”D”” mint half,s like your ? ask, i know you don’t want a ”guess”, but 1 of my guess*s is the * Philly mint pumps out more coins than *Denver as a whole of all the coins minted in the *U.S. so it might be cheaper for *Denver to mint 1.1,million 1/2 dollars, *Philly might have a bigger work load is 1 of my guess,s, but i really don’t know who pumps out more for that matter. @Joe Brown – The only way you can get the 2017 half dollars is to buy either a set of rolls (one from each mint) or a 200 half dollar bag (100 from each mint). Since the JFK half dollar hasn’t been put into circulation since 2001, it amazes me how many the Mint sells in circulating quality each year! I realize he was one of our most popular presidents, & is practically a God in Germany among Catholics (I lived there for 3 years & most homes have 2 photos on their walls – the Pope & JFK!) Most of them are put in the annual Mint set, but those are struck on separate coin presses at a little higher pressure. Where do the millions of JFK coins in the rolls & bags they sell of lesser quality go!? Probably to grading services trying to get a MS-70 jackpot!